CDR Writing Service CDR stands for Competency Demonstration Report. A CDR in itself contains five documents, the combination of which makes it whole. There are three Career Episodes along with their corresponding Summary Statements and a Continued Professional Development (CPD) document. Who needs CDR ? Students and Professionals alike who possess an overseas Engineering degree are required to submit CDR for the migration skills assessment. Engineers who deem the need to immigrate to Australia for better prospects have to get approved from Engineersâ&#x20AC;&#x2122; Australia through Migration Skills Assessment process. MSA recognises the qualifications either from designated Australian Institutions of Higher Learning or from the institutions based in countries who are a full signatory of Sydney Accord, Dublin Accord or Washington Accord. Applicants/Engineers belonging to countries other than those mentioned in the accords above must submit CDR for skills assessment. Step 1. Read Guidelines and Samples The first point in the process is to carefully read the MSA Guidelines provided in the MSA booklet containing minute details about the preparation of Career Episodes, Summary Statement and CPD. Any sample CDR that one can muster concerning the respective Engineering field can also be used as a reference. Step 2. Making a Strategy: Once the guidelines have been checked and information has been drawn from it regarding CDR preparation; projects to consider, technicalities to include in the CDR Etc. It must be carefully planned. Steps in preparation of CDR Step 3. Writing: Once you have chosen the three projects to base your three Career Episodes on, writing should be started. This is the part which is very crucial. As the projects are very elaborate sometimes, you have to decide what to keep and what to leave. Essential technical details must not be left out including figures, simple calculations etc. and details which arenâ&#x20AC;&#x2122;t that critical needs to be left out in the wake of the word count limitation of each Career Episode. Hiring a tutor at this point is one idea to follow. Step 4. Revise and Reflect: The next part after writing the Career Episodes, their corresponding summary statements and the CPD is to revisit all the documents and see if all the technical parts have been included or not. In addition to that grammatical mistakes and spelling errors must also be thoroughly checked to maintain language quality. Step 5. Look for Advisors: Even though you might have used all the techniques told before and developed the documents inclusive to CDR, you need to seek advice and suggestion about the quality of the CDR you have prepared. Since you have no idea about how it is going to be assessed by EA, it is a good idea to have someone else take a look at it, note down the points that can be improved and tell you accordingly about it. Rules for writing Career Episode The range of word count for each career episode must be between 1500 to 2500 words. The emphasis in the career episode must be on the explanation of technical responsibilities (personal roles in the project) so that possession of engineering knowledge and skills can be seen from it. The language, tense and sentence structure must be clear, free of jargons and to the point rather than unnecessary elaboration or repetition of similar statements. First person narrative must be used during the CE. Summary Statement The summary statement is written in first person narrative just like the career episode. Each competency element mentioned in the format must be addressed. The word count in a single Summary Statement for a Career Episode should be more than 900 words. Rather than copying all the words from career episodes, only a few sentences must be taken from it and rest of the things explained a concisely. Rules for writing Continuing Professional Development (CPD) Table format should be used while enlisting the professional development oriented activities. All the regular activities including education, work experience, internship, training, certifications must be included in a linear sequence based on the date of those activities. Some informal activities like short courses, online training can be included. It should not exceed one page. Components of CDR Assessment 1. Personal Information Passport Style Photo: You need to provide a recently taken passport size photograph of yourself with clear visibility of your face. Prime ID: You ought to provide your current passport bio-data page or a scanned national identity card wherever applicable. Name change documentation: If the name you have been using has changed over the course showing different names in academic documents and documents after that, you need to provide the supporting document for a name change. Curriculum Vitae (CV)/ Resume: You are required to provide a fully summarised form of your Engineering level education as well as work experience gained up until now (if any). The activities that you have followed up in your career must be shown in your CV with the mention of inactive periods as well. Bear in mind that the CV needs to contain a chronological listing of the work you have done rather than the projects. Donâ&#x20AC;&#x2122;t use more than three A4 pages to dictate your activities in the CV. Components of CDR Assessment For each place you worked, the details should include: Name of the organisation with location (Also provide the contact details if possible) Employment dates and duration Clear Mention of the Position occupied in the period of work (if multiple positions at different time frames/projects, you can mention them as well) Finally, you should provide a summary of the roles you performed in the organisation. In hindsight, you can also include the specific projects that you did in the period you worked for the company. Language Competency (English): The process of skills assessment must be supplemented with the proof of English language competency which is a must. 2. Application Information You need to make a selection about the engineering occupation in which you seek an assessment. After that, you need to provide the evidence of your professional registration if applicable. Components of CDR Assessment 3. Education You need to provide all your degrees, certificates as well as official transcripts. In case you have more than one engineering qualification, those should also be provided. Also, if you have currently enrolled in any formal education program, letter of your enrollment and your current transcript must also be made available. 4. Employment All the work experiences mentioned must be supported by documentary evidence. If the document is not in English language, it should be translated by an authorized translator. Both the original language and translated copy should then be provided. Applicants who have claimed engineering employment for more than 12 months or have based their career episodes upon professional experience must provide a reference letter from the employer. The reference letter should be on official company letterhead stating your title/position, dates of commencement and termination of work signed by the companyâ&#x20AC;&#x2122;s manager. Components of CDR Assessment 5. CDR Report The CDR report must contain three distinct career episodes along with a merged summary statement for all three and a Continuing Professional Development document (CPD). Plagiarism and Warning from Engineers Australia Plagiarism is a serious issue when it comes to Engineersâ&#x20AC;&#x2122; Australia. Care should be given during the draft preparation of Career Episodes and Summary Statement. If any plagiarised content is found in your documents, you will receive a warning from Engineersâ&#x20AC;&#x2122; Australia first asking for an explanation of why the plagiarised content was used. If you fail to explain the reasons, the issue can lead to you being banned for 12 months in addition to your details being reported to the department of home affairs. 1. Lack of technical portions in the career episodes: The assessment of your CDR is solely done to see your competency towards your engineering occupation for which you want to get your skills assessed. Hence the engineering-oriented technical activities specific to your occupation must be seen in your career episodes. If enough technical details arenâ&#x20AC;&#x2122;t present in your career episodes, your CDR has high chances of facing rejection from EA. 2. Improper Documents/Proofs: If the proofs that you provided as references for the CDR you submitted are not sufficient enough to prove that the information in career episodes is correct, your CDR will get rejected eventually. Similarly providing misleading information in your documents will make the matter even worse. Reasons for rejection of CDR 3. Plagiarised content: Your CDR needs to be prepared based on your original work. If plagiarised content is found in your CDR, it will not be acceptable to EA at all. 4. Word Limit: Each career episode in your CDR must be between 1500 to 2500 words and not more or less than that. Please remember that lesser word count might not include all your technical details of the project, and higher word count would be in similar lines with a report which is not desirable by EA. Hence word limit should be maintained for the CDR not to get rejected. 5. Distinct Career Episodes: There are three career episodes in the CDR. All three must be trivial with no similarity between each other. Some general parts can be similar, but the core technical parts of all three must speak of different projects. Another thing to be clear about is to use the first-person narrative in detailing your work rather than the group activities. 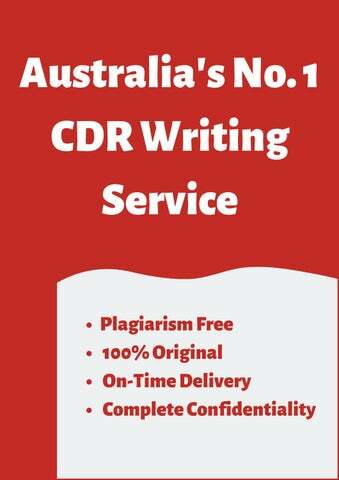 Remember it is your competency EA is trying to assess and not your groupâ&#x20AC;&#x2122;s.
Things to consider before hiring a CDR writer The CDR Writing Service should be registered in Australia Selecting a consultant based in Australia itself is imperative. Often it can be seen that the consultants based outside Australia prepare the CDR which has high chances of facing rejection from EA. The consultants outside Australia are not very familiar with the Australian Work Environment and legislation scenario leading to the rejection rate being high for them. CDR writing service provider should be familiar with the immigration process Every service provider for CDR writing must know the immigration process followed by the Australian Government. The Migrations Skills Assessment (MSA) process must be clearly understood and known by them. In addition to that requirements and criteria to be fulfilled, type of visa suitable for an applicant etc. must also be known by them. Proper knowledge of these factors can help a writing service provider to write a perfectly tailored CDR for every client.